Delegations from 47 countries, plus the United Nations, the International Atomic Energy Agency—the IAEA—and the European Union participated in the forum. 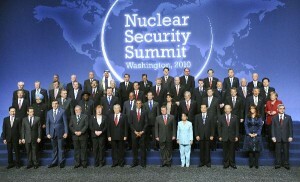 Russia was represented by President Dmitry Medvedev. Discussions on all measures were closed, but we know that the heads of state spent most of their time on national and international efforts to ensure nuclear security throughout the world. The final communiqué stated that within the next four years the participating countries will attempt to secure all vulnerable nuclear materials and make certain they do not fall into the hands of terrorists. On the sidelines of the summit, Russia and the United States concluded an agreement to dispose of surplus weapons grade plutonium: according to the document, each party must burn 34 tonnes as reactor fuel. Russia intends to allocate $2.5 billion to carry out this program. According to Medvedev, the last Russian reactor producing weapons grade plutonium will be closed by the end of April. That reactor is located in the city of Zheleznogorsk in the Krasnoyarsk Krai. After the summit, President Medvedev shared his impressions in a speech he gave at the Brookings Institute to an audience of US political and business leaders: “I cannot recall a more unanimous summit. In the past year we have managed to change the atmosphere of Russian-American relations, and I am pleased that I was involved. We went from extreme to extreme: sometimes we were suffocating each other in embraces, sometimes we were miles apart. Now we need to work on developing practical relations for the future. We don’t need to teach each other how to live, we need to communicate. And communicate on a regular basis.” Medvedev said that Russia is prepared to “lend the United States its shoulder,” if need be. President Medvedev feels that a great deal has been said about the importance of the new START treaty, but the main thing is to finish the job, that is, to ratify it in both countries’ parliaments. Medvedev said that he and Obama agreed to simultaneous ratification, preferably in early May. Iran was another topic addressed by Dmitry Medvedev. He said Iran’s nuclear program actually constitutes a global threat to the entire international community, and he did not rule out sanctions. However, he believes that they must be very carefully weighed and should under no circumstances affect the civilian population. Israeli Prime Minister Benjamin Netanyahu refused to attend the summit because of news that some countries, including Turkey and Egypt, planned to demand that Tel Aviv join the Treaty on Non-Proliferation of Nuclear Weapons. The treaty was signed in 1968, and 189 UN member states have acceded to it. The heads of Iran and North Korea were blacklisted; Barack Obama did not send them invitations. Syria likewise was not invited to the meeting because the United States believes that it plans to conduct research on nuclear weapons. Experts point out that the meeting organizers “softened” the agenda to avoid sharp conflicts. That applies not only to Iran and North Korea, but also to Pakistan’s startup of new facilities to produce weapons grade nuclear materials and India’s capability for acquiring more nuclear arms. 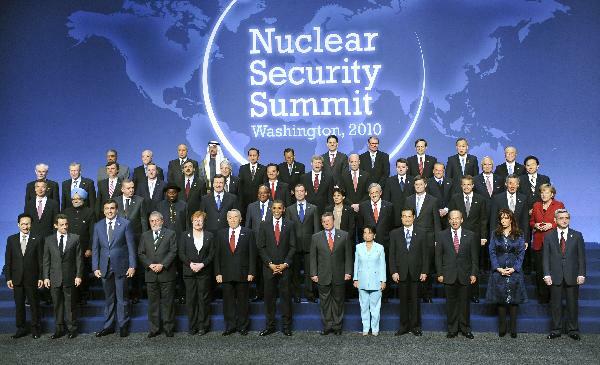 Neither country has signed the Treaty on Non-Proliferation of Nuclear Weapons. During the summit, Barack Obama said he is convinced that by ignoring the opinion of the international community North Korea and Iran are moving ever closer to complete isolation, but that isolation should convince Tehran and Pyongyang of the need for dialogue. He believes that new, more stringent sanctions must be imposed against Iran, and it should happen as soon as possible.